The consistency of this convoy clearly indicates that this is a complete battle formation that traveled a long distance. In other words: a fresh Russian convoy has entered Lugansk. A lot of tracks with turns can be seen. This only means one thing: it is used as a temporary overnight camp. Red encircled area = our current area. The other light green areas show similar features, but no vehicles can be seen (anymore). The red areas DO show vehicles. The fact that these Hurricanes first have been seen on a train and then heading to this camping site, and the fact that they don't have license plates, means only one thing: they are heading for Ukraine. The earlier satellite images show that this region has been used in a similar way for the summer invasion of Ukraine. Ukrainian Security Service released three videos with english subtitles of the Russian Spetsnaz soldiers captured near the town of Shchastya, while they were trying to sneak into Ukrainian positions they thought were abandoned. Here they are with the translation typed out. Is it 3rd Special Forces Brigade? Since when have you been in the ATO-zone (Anti Terrorist Operation)? What's your commander's last name? What area did you operate in? How many men were there in your group? What where their last names? The commander is Erofeev, his deputy is Azimov. Have you been physically coerced [to talk]? Are you an active Russian military serviceman or a reservist? I'm a Russian military serviceman. When did you start military service? Are you a contract soldier [as opposed to a draftee]? Yes, I am a contract soldier. Any time, any place, any mission. That's the military intelligence motto. How many groups do you know to be working in this area? We mean specifically groups of Russian soldiers. 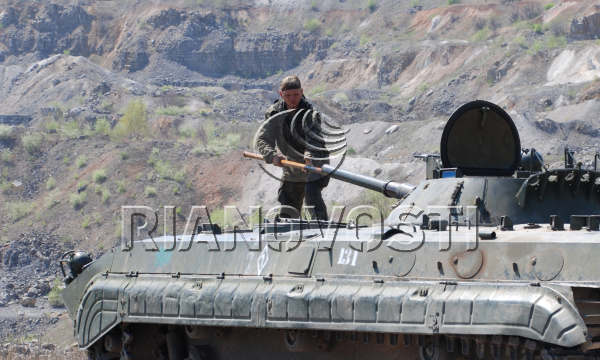 How many groups are working in Shchastya area? There is one group we rotate with at Shchastya. Any other groups working in this area? I don't know any others. You don't know your mission either, right? What was your latest order? Move out and observe without crossing the contact line. How did you get wounded? What was your specific mission? We came closer and were spotted. As we were pulling back, I got wounded in the leg. Have you crossed the contact line? Once again, tell us your specific mission. To observe and report results. For how long do you come here, do you rotate or is this your constant location? Then you get back to your permanent base? Yes, to the city of Luhansk. Do you arrive here on vehicles? Any armor? IFVs [Infantry Fighting Vehicle]? What's your brigades commanders last name and rank? What about your company commander? Where's your brigades permanent base? Describe your contacts with the locals on your side of the line. Do you get information of them? We get no information from them, we get it from the rebels. Describe your contact with the so-called 'rebels'. Do you do joint operations? We haven't done any joint operations. Do you have orders not to contact them? We do communicate, but we have no joint operations and we don't tell each other about our missions. I take it your unit is autonomous and does not cooperate with anyone? 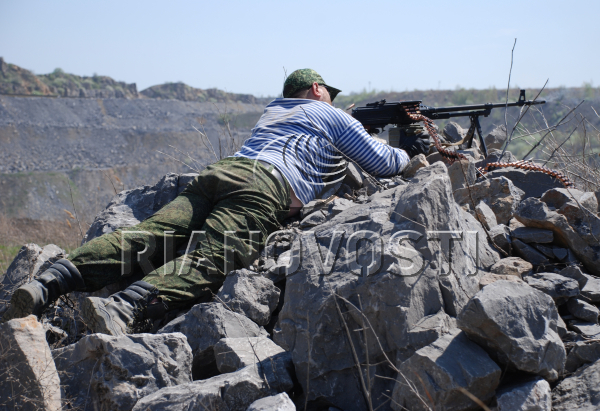 How many groups do you know to be operating out of Luhansk? Do you know any last names of other groups members? Well, there's another sergeant Alexandrov. Also an autonomous group member? Yes, he is a section commander. Where is that group operating now? It's currently staying in Luhansk. Where did it operate before that? I am Aleksandrov Aleksandr Anatolievich, born on January 7th, 1987, citizen of Russian Federation, reside at the address: Kirovsk region, Malmyzhskii district. I am an active duty military of the Russian Federation. I serve at the military unit #21208, the 3rd Guards Separate Special Purpose Brigade, based at Tolyatti city. The brigade commander is colonel Shchepel Sergey Anatolievich. 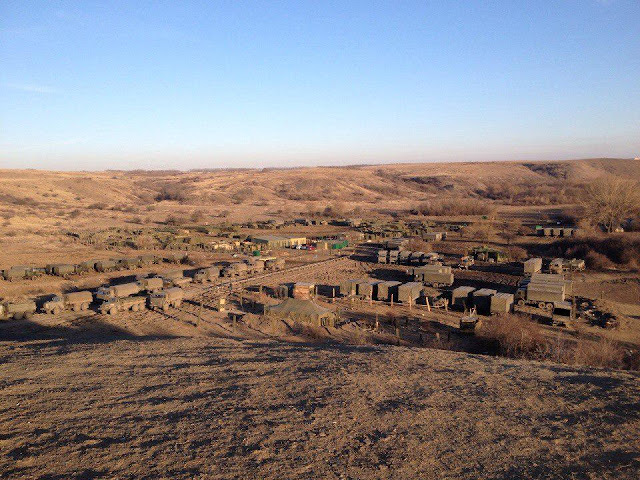 We entered the territory of Ukraine on March 26, 2015 as part of the 2nd battalion comprising 220 men. The battalion commander - Napolskikh Konstantin Nikolaevich, major, citizen of the Russian Federation. Makorin Vladimir, I don't know his last name either, call sign Mahoney. The mission assigned to us was to keep the Ukrainian troops under surveillance. What was the place of deployment in Ukraine? Oktyabrsk district of Luhansk city. On the day we were detained the chief of group assigned a task to conduct supplementary terrain reconnaissance in the area of a bridge just outside the Shchastya town. When we moved there and took up positions, we detected a fortified area and started to surveil the area, the two of us, for about an hour. As we noticed no signs of movement or life of Ukrainian troops, we decided to move closer. Having moved closer, we proceeded with observation for some time. Having detected no Ukrainian troops, we decided to move as close as possible, as we decided that this fortified area had been abandoned or people left for another area. When I got to a trench, I went to examine a dugout. Captain Yerofeev and corporal Krasnov watched my back. When I heard shooting, I turned around and saw a wounded Ukrainian soldier on the ground. Then we received a Retreat!-order, so we ran. We ran about 15-20 meters and I fell, as I was directly shot in the leg - hip fracture. I crawled away as far as I could. I crawled about 50 meters away, took position in a trench and decided to give myself first aid. While I was giving myself first aid, I was detained by militaries of the Ukrainian army. I am a citizen of the Russian federation Yerofeev Evgenii Vladimirovich, reside in Tolyatti city. I am an active duty officer of the Russian Federation. My military rank is captain, my position is a group commander. I serve in the 3rd Guards Separate Brigade based in Tolyatti city. What is the ID information of the brigade commander? Lieutenant colonel Shchepel Sergey Anatolievich. I moved into Lugansk region in early April, I don't remeber the exact date, as part of the 2nd squadron of the 3rd Guards Separate Special Forces Brigade. The acting squadron commander is major Napolskikh, a citizen of the Russian Federation a serviceman. We were assigned with a task to conduct the reconnaissance by observation of the forward line of adversary troops and elements deployed nearby - units of the resistance naad Cossacks. 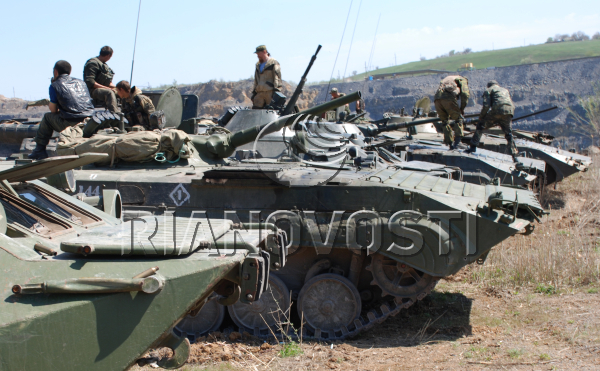 The squadron is deployed in Lugansk city. I don't remember the exact address, but it is a private residences area close to the Vavilov quarter. The squadron comprised three companies, with four groups in each. My group consisted of twelve men: myself - group commander, deputy group commander, two section commanders, two snipers, two machine-gunners, two combat engineers, two reconnaissance agents, two senior reconnaissance agents. All are citizens of the Russian Federation. recon agents/paramedics - Grigoriev Vladimir and Alexandr Aleksandrov. The mission was to conduct reconnaissance by observation, with at that time order not to cross the contact line, not to open unnecessary fire. Due to the persistent shelling of the positions, I decided to change position and move forward in a group of three in search for a new position. In the course of searching for new positions, I stumbled upon old trenches and surveilled them. The trenches seemed to be abandoned. We decided to examine them. I ordered two men to check the trenches. I stayed to watch their backs. When the militaries entered the trenches, the slaps followed and then - they are running shouting Retreat!. We started to retreat when they opened fire at us. I got gunshot wounded into the hand, a comminuted fracture. I fell down and fainted for a while. When I was up I started to crawl, I didn;t creep far away - Militaries came from the trenches. They didn't kill me; they detained me and rendered aid. And now I'm here. When I was detained, frankly speaking, I thought that they would kill me at once. I wanted to blow myself up with a grenade, but the right hand would not obey, I couldn't reach it. I failed. I could not reach it with the left hand either. While I was doing that, militaries came from the trenches and detained me. They put me in a stretcher and carried me away. 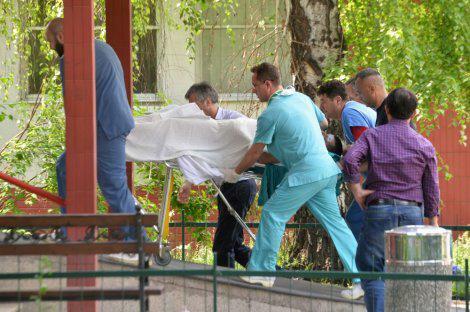 I was taken to a hospital in Shchastya. I was given first medical aid there. What is your opinion of the Armed Forces of Ukraine? A lot is being told on our side. As to what I have seen myself - I have no complaints against the Armed Forces of Ukraine. Does that what they say to you on TV in Russia correspond to the reality? A lot is told on TV. We don't watch everything and don't listen to everything either. I think no one needs this war. While the top circles are skimming the cream, the lower are choking with blood. This is an excellent example of how Russia's Hybrid Army in Ukraine works. 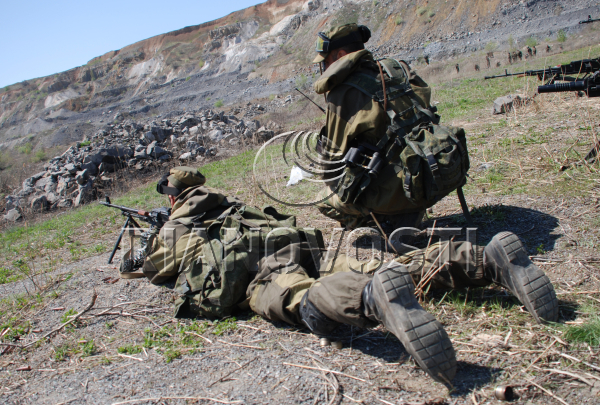 beside the so-called 'militias' which are basically mercenary groups, it also consists of independent Special Forces Units from the 'official' Russian Army that operate autonomous with special tasks. While these guys say they did not cross the contact line, they obviously did. And while they say they had to observe, they clearly intended to occupy new/abandoned territory. 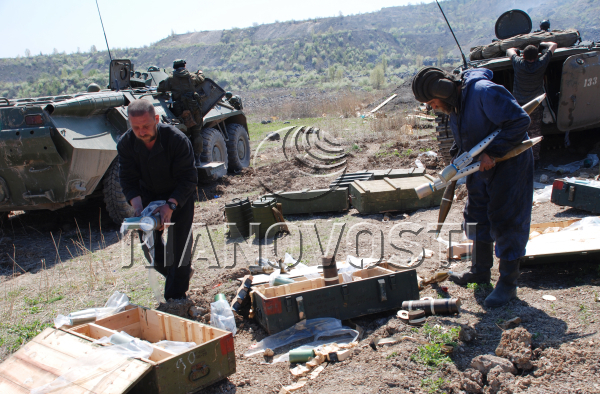 Probably to set traps, lay mines or to ambush Ukrainian troops. Yerofeev says he was afraid to get killed, so he wanted to kill himself with a grenade. That doesn't make sense. Likely he wanted to defend himself by throwing a hand grenade. While these Russians get medical help, the Russian themselves kill Ukrainian POWs! Also see: Russia fights a HYBRID war with a HYBRID army. Also see this translated interview by Russian Novaya Gazeta. Yandex maps has recently updated several satellite images at the border of the conflict area between Russia and Ukraine on locations that its equivalent Google Maps does NOT show (yet). In Dmytrivka the Russians established a HQ at a former Ukrainian Border Guard building, where they had tortured and possibly killed Ukrainian POWs. See this blog. The wide tracks look similar to the tracks of the invasion that ambushed the retreating Ukrainian troops from Ilovaisk. See this blog. Or this one. Note the long white truck that looks like the trucks used for the so-called 'humanitarian aid' convoys. 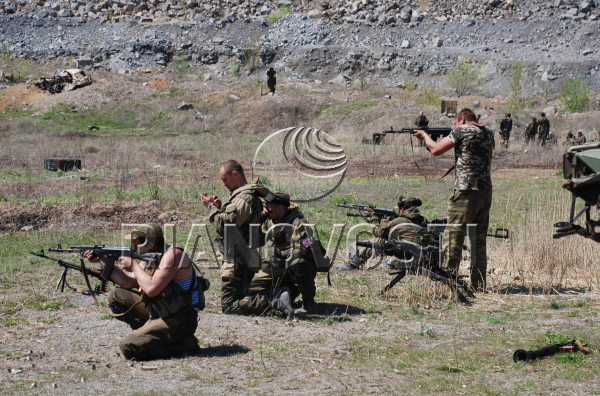 Now the Russian news agency published photos of trainings that can be located there too (Thansk to @GorseFires). As can be seen it is in and near a quarry. It is hard to exactly tell how many vehicles are located between Komsomolske and Telmanove, but there are a lot and they are getting trained. They could be used to force a breakthrough south of Volnovakha and north of Mariupol, as to bypass Mariupol and surround it in the next offensive. 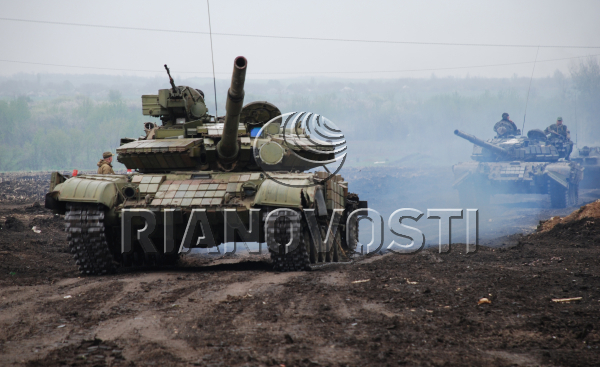 @DajeyPetros The large volume of photos/video of Russian ground forces (incl DPR/LPR) training in May means only one thing: preparations. 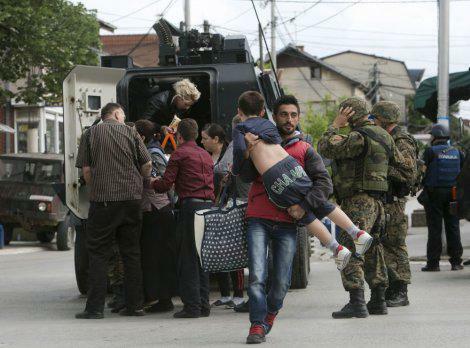 On May 9th Victory Day footage if armored vehicles, explosions and burning houses appeared, not from Ukraine, Donbas, but from Kumanovo, Macedonia. At the end of the day it is still very unclear what is exactly going on and who the government is fighting. 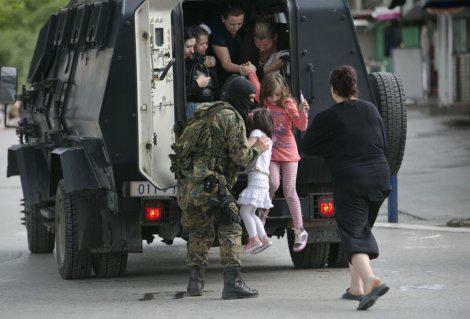 Albanians, (Russian-backed) Serbs? Kosovans? Is it a local uprising? This Reuters article gives the best insight so far. We DO know that Putin is (almost) everywhere where destabilisation of Europe is going on. Do the Russian (and Serbs) have to do something with this? But the other two impacts with the yellows lines indicate the shelling came from North-East direction, which is Russian occupied territory. Also it is clear that such an impact never could have come from Western Ukrainian side. Also see: another earlier example of how Russia tries to blame Ukraine for shelling Donetsk. Here is a Ukrainian language debunking blog about this shelling.